Simon & Schuster UK, 9781471152757, 480pp. A comprehensive examination of the continually changing world of money, economic theory, and how we got things so wrong in the run-up the 2007 recession—and how we can rebuild confidence for our financial future. 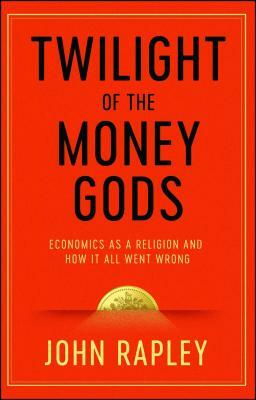 Twilight of the Money Gods is the story of economics, told not as the science it strove to be, but as the religion it became. Over two centuries, it searched for the hidden codes which would reveal the path to a promised land of material abundance. While its prophets—from Adam Smith to John Maynard Keynes and Milton Friedman—concerned themselves with the human condition, its priesthood gradually grew remote from its followers, until it lost sight of their tribulations. Today, amid a crisis of faith in their expertise, we must re-imagine the topic of economics for a new era—one filled with both danger and opportunity.